Wally is a Qt4 wallpaper changer, using multiple sources like files, folders, FTP remote folders, Flickr, Panoramio, Ipernity, Photobucket, Buzznet, Picasa, Smugmug, Google, Vladstudio and deviantART images. Now it's available in many languages!! Note for Ubuntu users: if you're using KDE4, please use _kde4_ packages!!! If you have KDE4, your enviroment will be automatically detected, and WallyPlugin will be installed. Remember to restart KDE4 (logoff/logon should be enough) in order to use Wally. Then, select WallyPlugin in Appearance Settings. To be clear, WallyPlugin IS NOT Wally. 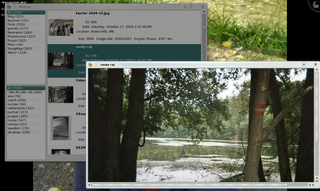 It's just a "brigde" between Wally and KDE4, and it must be selected to show Wally images, so Wally has to be started. When launched, Wally places itself in your system tray. Right-click on icon to show main menu. In Settings window, just select a module, and add items in the list. Wally will download photos according to your search keywords, or use your photos if you're using Files / Folders modules. You don't need to be neither a developer, nor to understand Wally's code. And, if you need help in using Linguist, just write me. · JBS is based on .NET, a framework that is not installed on every PC, cause of its "heaviness" and system resources' usage. · And, mainly, it cannot run on platforms like Linux / MacOSX. · Francesco De Marchi, Sylvain Gueniot, Oliver Schwabedissen, Ferhat Dogru, Corrado Guarino Lo Bianco, Filippo Venturini, Klaus-Peter Gores, Mike Cooper, Mario R. Carro, Serge Sander, Martino Vedana, Mirko Bianco, Elbert Pol and Alex Roma for bugs reporting and time spent in testing. · Photobucket staff, for support and promoting.